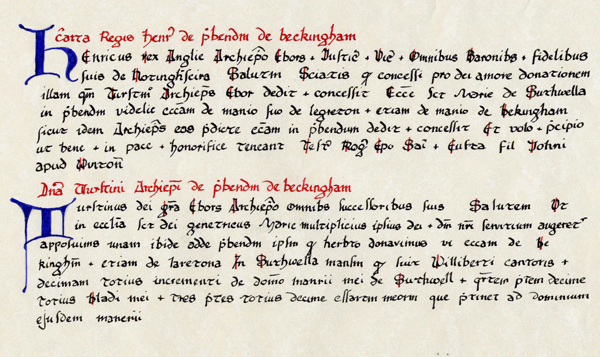 The White Book of Southwell, a compilation of manuscripts made in the 13th century shows that Thurstan, Archbishop of York from 1114 to 1140, founded a Prebend of Beckingham sometime between 1120 and 1135. "Thurstan, by the grace of God Archbishop of York, to all his successors, Greetings. 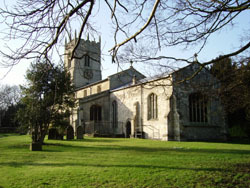 In order to increase the service of God in the church of the Blessed Mary, Mother of God (at Southwell), we have added there one Prebend, which we have given to Herbert, namely the church of Beckingham and also that of Leverton; in Southwell the mansion that belonged to Gilbert the Chanter; the tithe of the whole of the extra grain of the lordship of my manor of Southwell, a quarter part of the tithe of all my corn and three parts of the tithe of my reclaimed lands that belong to the lordship of the same manor"
"Henry, King of England, to the Archbishop of York, the Justiciars, Viscounts, Barons and all the faithful of Nottinghamshire, Greetings. Be it known that for the love of God I confirm the donation of Thurstan, Archbishop of York, to the church of the Blessed Mary of Southwell for a Prebend the churches of his manors of Leverton and Beckingham and I wish it to be held in peace and honour for ever"
The Prebendaries each owned a house at Southwell and enjoyed special privileges and responsibilities in the administration of the Minster and the prebendal lands, which were known as Peculiars, of Southwell. Visitors to Southwell Minster may see that one of the stalls on the north side of the choir shows the name Beckingham, as does one of the seats in the Chapter House. At that time the whole of Nottinghamshire lay in the Diocese of York and it appears the Prebendaries were intended to help the Archbishop in the administration of the southern part of the diocese. They in turn were assisted by Vicars Choral at the Minster and Vicars Parochial who officiated in the Parish when the Prebendary was absent. Originally the Prebend was called Beckingham but included Leverton. At a later date, 1291, Leverton became a separate Prebend. The area of the Peculiar eventually included South Wheatley as well as Beckingham and North Leverton. The Ordnance Survey map of Monastic Britain, which purports to show the boundaries of peculiars at the time of the suppression of monasteries, indicate that these coincided with the present parish boundaries. Remarkably the Chapter of Southwell survived the Reformation. The prebendal lands eventually passed to the Ecclesiastical Commissioners following an Act of Parliament passed in 1840. A year later Nottinghamshire ceased to be in the Diocese of York and was transferred to Lincoln. In 1884 the Bishopric of Southwell came into being and comprised of Nottinghamshire and Derbyshire. Finally, in 1927, a separate Diocese of Derbyshire was created leaving that of Southwell in its present form. Meantime the Duke of Newcastle had become Lord of the Manor of Beckingham and the gift of the benefice had passed to the Lord Chancellor. 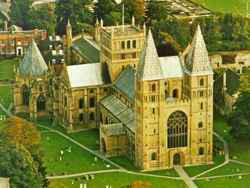 Click here for Southwell Minster site.